Restoration of an historic Cornish fishing boat at Newlyn could be completed by July. Ripple, a 110-year-old doubled-ended lugger, was once one of many boats of its type fishing for pilchards, mackerel and herring off west Cornwall. For 70 years she was a houseboat on the river Fal before she was rescued by owner John Lambourn in 2003. 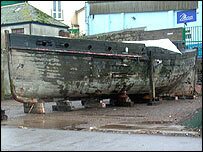 Now Mr Lambourn wants to restore the Ripple, one of only two left, to her full sailing condition. Work has included replacing decayed and damaged frames and hull planking, refastening of the hull and a new deck. That will be followed by installation of masts, rigging sails and two wing engines although the original Ripple would have been sail powered. Mr Lambourn, 57, who has made his home in the port after 30 years in Hong Kong, said: "It is not restoration for restoration's sake. "People will be able to go on board and we are going to try to give her a new function when the work is complete. "But she will be returned to full sailing conditions to sail in local waters."